In this featured blog post, learning manager, group fitness instructor, yoga teacher and White Space Wellness yoga teacher training graduate January Gabriel shares her story of the #roadlesstraveled. At the edge, there is stillness. In July 2012, I was a hypertensive and obese workaholic focused on climbing the corporate ladder. Fast forward to the day the shot on the left was taken—I found myself medication-free for years, 80 pounds lighter and almost entirely vegetarian. While I still have the same day job, I am motivated to do it to share Light and to help others. The photo referred to above was taken at the Chamantad-Tinyan Viewpoint at Sabtang Island in Batanes on June 30, 2018—six months shy of my 40th birthday and nearly six years to the day when I made the conscious decision to lead a healthier and more balanced lifestyle. Sticking to that decision has taken a deliberate and conscious effort. The road’s been strewn with challenges and disappointments, but it’s also led to sweet surprises and simple joys. 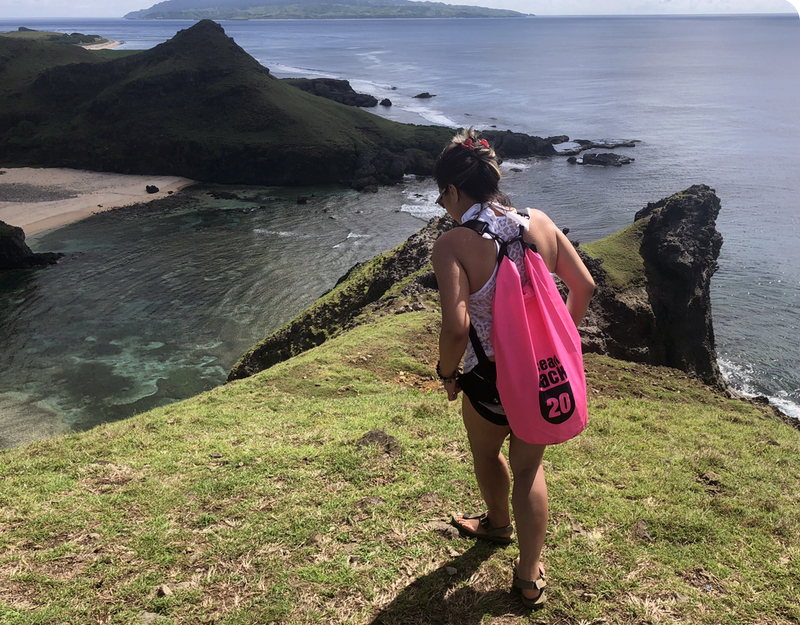 I took this trip to Batanes to celebrate my first few hundred hours of teaching yoga since I completed my yoga teacher training in 2016, but I also made it just to breathe, step away from the everyday and savor moments of simplicity in a place of such splendor. So how did I get here to this space of stillness at the edge? By learning to say “no”: no to working more than 10 hours a day; to slaving to the grind nearly every day of the week; to being compelled and urged to move up the ladder in my industry; to accepting “promotions” to positions of “greater esteem” and or a higher pay-grade; to eating meat and too much starch and too many simple carbohydrates; to sleeping less than four hours a night; to staunching regular nosebleeds due to elevated blood pressure (while I could keep my cool on the outside, I’d be a raging inferno on the inside); and to worrying about the weather and a number of other things beyond my control. But I also arrived at this point by learning to say “yes” to other things: yes to practicing yoga and exercising at least four times a week; to becoming a group fitness instructor; to completing yoga teacher training (two so far and more to come! ); to teaching yoga or fitness classes at least four times a week; to eating fresh fruits and vegetables; to learning other holistic healing modalities; to attending classes focused on spiritual well-being; to praying, meditating and doing my self-healing routines daily; to choosing an attitude of abundance and gratitude; and to springing forth from a place of giving and compassion. Some of the “yes-es” I mentioned were, in a manner of speaking, unnecessary. I’d already gotten down to a healthy weight by 2015 and I could have just settled for regularly going to the gym or practicing yoga to maintain the level of health and fitness I had then. While that would have been satisfactory for most people, I felt that my rightful place was “at the edge,” and that I needed ways of preventing myself from rebounding to a life of complacency and stagnation. That’s why I started teaching group fitness classes, teaching yoga, and so on and so forth. Throughout this journey, I’ve discovered that I value improving all aspects of my health more than reaching new heights at my regular job. Although it’s unusual in the fast-paced business process outsourcing (BPO) industry, I’ve chosen my health and well-being over every single chance to rise in rank. While it was difficult to do this at first, nowadays I can make the choice without much hesitation. After all, the things of the world simply make for temporary distractions. The blessings of health, healing, happiness and harmony, however, are more impactful and enduring. Light, beauty and love—these compose the stillness that I create.